The Christmas in Ida, Holiday Hounds on Parade held on Saturday, December 7 is a unique parade featuring our canine friends small or large, in a parade of their own, walking through the Village of Ida. This event is a must for all dog lovers. 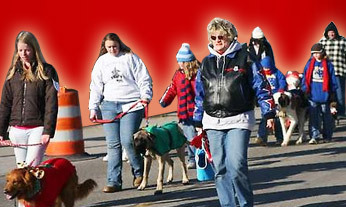 All breeds of any age dressed in their holiday finest will delight parade visitors who line the streets of Ida. Participants will be judged as they walk the parade route in their holiday finest beginning at the Ida United Methodist Church on Ida East Road; west to Lewis Avenue; and south to Ida Street making a loop and returning to the Ida United Methodist Church where the parade ends. Winners will receive plaques and a gift for their pooch. The following awards will be awarded. The Holiday Hounds on Parade will choose a Prince and Princess who will be featured in the Parade of Lights and will ride on their own float. Rules and entry number will be mailed or available the day of the event at the registration table at the Ida United Methodist Church. Check in will start at 1 pm and the parade will kick off at 2:15 pm. Participants must have their dogs on a leash at all times and will sign a hold harmless agreement at the registration staging area. Parking will be available at the Ida Township Community Center. The parking lot is accessible from Van Aiken Street (by the water tower). Entry forms can be downloaded from the website or are available at United Way, Cheryl Wassus, Holiday Hounds on Parade, 216 North Monroe Street, Monroe, Michigan 48162 or from Zorn's Service, Inc. in Ida. Entry Forms can be mailed or delivered to Cheryl Wassus' attention at the United Way with a $5.00 entry fee made payable to the Ida Civic Club.